In The Game Inc. recently announced that its next major trading card release will be the latest in a series of products dedicated to the history of a single franchise. In the past, this format has focused primarily on Original Six squads, namely the Toronto Maple Leafs and Montreal Canadiens. This time, however, one of the “Expansion Six” squads gets the nod, as the Philadelphia Flyers are tributed in “Broad Street Boys”. Releasing near the end of June (the projected date is June 29), the product will include a lot of the goodies In The Game has delivered to collectors in past sets. There will be an extensive autograph series that captures both past and present Flyers greats (initial images tease Jaromir Jagr and Claude Giroux), while memorabilia card programs are slated to feature sweaters and sticks from up to six players on a single piece. Checklist information at this time is fairly sparse, but Flyer faithful can look to expect both the hobby darlings and cult heroes as information becomes available. Among the names already listed for inclusion in the product, one way or another, are Ron Hextall, Dave Schultz, Braydon Coburn and Bernie Parent. 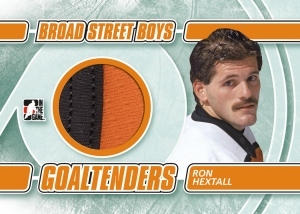 Broad Street Boys will be distributed in 14 card packages – including eight base cards and six inserts.